Growing zucchini in the home garden is relatively easy and doesn't require a lot of space. 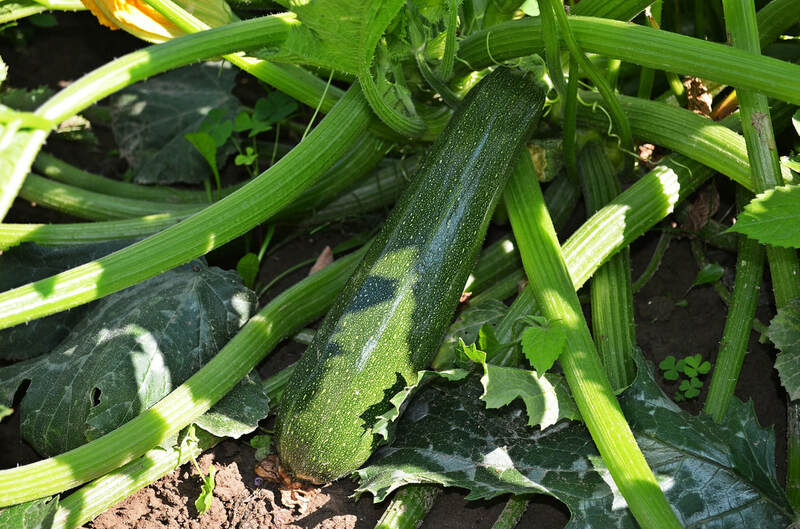 Even though zucchini plants are huge with gigantic leaves, they do not vine like other squash and do not require staking. One or two healthy plants provide enough fresh zucchini for a family of four and can be tucked into the corners of raised beds or along the border of the garden creating lush green foliage and abundant fruit. Location: Zucchini prefers a sunny location that receives six to eight hours of direct sunlight a day - but hours of sunlight do not need to be consecutive. A few hours of sunlight in early morning, noontime shade and direct sun in the afternoon works well. As long as the hours of direct sunlight add up to at least six, your zucchini will thrive. Preparing soil: Zucchini prefers rich well-drained soil. Till the soil to a depth of eight to 10 inches and amend with generous amounts of organic matter, such as compost or well-rotted manure. This improves the texture of the soil, adds slow release nutrients and promotes both good aeration and drainage. Fertilizer: Apply 5-10-10 fertilizer before planting, following the application rate on the container. Work granular fertilizer into the soil well to avoid contact with seeds or plant parts, as fertilizer "burns" the seeds and damages your plants. I apply water-soluble fertilizer to my zucchini plants every two weeks during production. Planting: Plant zucchini seeds in the spring after the soil has warmed to at least 60 degree F, all danger of frost has passed and daytime temperatures remain in the 70s. Planting seeds in cold soil often results in seeds that rot in the soil or fail to germinate. Watering: Keep the soil evenly moist, watering deeply once or twice a week - or whenever the soil feels dry to the touch one inch below the surface. Zucchini grown in raised beds may need daily watering. Blooms: Zucchini plants produce both male and female blooms. Male blooms appear first to attract flying insects and female blooms appear a week or two later. Male blooms appear on a slender stem, whereas the female bloom has a swollen ovary at its base. When the blossom is pollinated, the bloom shrivels and dies, but the tiny zucchini at the base begins to grow. Harvesting: Harvest baby zucchinis as soon as they are large enough to eat. For the tenderest fruits pick them when they are no more than two inches in diameter and are four to eight inches long. As the fruit matures, the outer skin toughens and seeds enlarge inside the zucchini. Harvest all fruits as soon as they reach this size to encourage your zucchini plant to continue producing new zucchinis - otherwise the zucchini plant will cease production. If you want large zucchini for making zucchini bread or muffins, wait until the end of the season and allow the remaining zucchinis to mature on the vine.